The collection of Japanese miniature art illustrated and described on this website is highly interesting on several fronts. John Cohen and his wife Trudy are second generation collectors. John's father George A. Cohen formed the original collection of netsuke and inro, starting in the 1940s and published the collection in his book, In Search of Netsuke, in 1974. His son John was always fascinated by the various art forms that formed the collection and continued, though expanding outwards from the netsuke and inro, to include lacquer boxes, jade pendants and snuff bottles, which form the Chinese section of this disc. A number of the pieces shown here were illustrated in George Cohen's book. 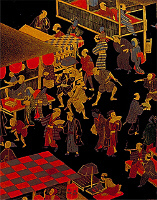 One finds very few publications in these specialised days that combine Chinese and Japanese works of art. All of the small pieces within the collection are highly personal whether worn, handled, or made purely for use. The quality of work, subject to such very close inspection, rather than for display had, of necessity, to be the finest possible. The Japanese collection divides automatically into two parts. The first of these encompasses the netsuke collection, featuring 57 examples, covering most of the major schools of carving and types. There are fine examples from Kyoto, Osaka, Edo, Nagoya, Gifu and Hakata, as well as unsigned and unattributable pieces from the early 18th to the late 19th century. It is difficult to pick out any one piece from the collection that stands out above the rest, but my own eyes were immediately struck by the ivory study of a cockerel and hen in a winnowing basket or corn scoop, by Otoman of Hakata (N7). His work is very rare and this appears to be the only recorded example of such a subject by him. The Kyoto artists, both of the 18th and 19th centuries are well represented by several examples, including the study of a reclining boar on Autumn leaves (N11), the wood study of a tiger (N14) the ivory goat by Tomotada, (N23) and the fine study of a bullock or ox, by Okakoto (N56). The work of artists from the Asakusa district of Edo (now Tokyo) have always interested me and I was delighted to see the two wonderful examples by Ishikawa Rensai, the stag-antler model of a frog on a mushroom (N42) and the somewhat similar study of a rat on a peach (N44). The second section is devoted to inro and small lacquer boxes. Here, the time span is somewhat shorter, most having been made during the latter part of the 18th and the 19th centuries. Among these, one might select (L1), an unusual tan-ground lacquer inro, decorated with rats stealing eggs by Shibata Zeshin (1807-1891). Other master lacquerers represented include Yamada Jokasai (L3, L20, L26), Yamada Toyoyoshi (L24, L27), Tokusai (L7), various generations of the artists called Shiomi Masanari (L9, L11, L12, L32), Shunsho (L10), Hasegawa Shigeyoshi II (L15), Koma Kyuhaku (L4), Koma Koryu (L23), Koma Kansai (L2), Hara Yoyusai (L29) and one extraordinary inro decorated in the elaborate Shibayama style by Nemoto (L6). The collection also includes a fine selection of 26 small boxes, combs and other lacquer items, as well as other items of Japanese decorative arts of the Meiji period (1868-1912). By some standards, the collection is not large. However, it does not need to be; there is much to be said for quality, rather than quantity and the present collection has the former in abundance. It has been a great pleasure, long overdue, to review the snuff bottle and pendant collection of Trudy and John Cohen. It is a tribute to their artistic awareness that they have been able to assemble so many works of art in these two areas, while maintaining the common bonds of excellent workmanship, charming subject matter and, above all, that elusive bit of 'magic' (for want of a better word) that turns an inanimate object into something special and important. I first met Trudy and John at the galleries of Hugh Moss, Ltd in Bruton Street some 28 years ago. At the time, they struck me as a couple who were devoted to each other and to the pursuit of these miniature works of art. Since those heady days, they have built this large collection together, and it has taken me some time to become acquainted - or reacquainted - with all their acquisitions. I use the word 'acquisitions' lightly, but anyone who has formed or is forming a collection knows that it is often a laborious and sometimes lengthy process. One is not always able to obtain or, indeed, to afford what one would like; setbacks are frequent. Real collectors tend to forge ahead, taking risks and letting the chips fall where they may, even if they are often left wondering whether they were right to make decisions with such haste, but they have learned by experience that an opportunity lost by hesitation can cause lasting regret. Trudy and John have been diligent in their pursuit of snuff bottles and pendants, never letting the various dealers involved in their field forget that should anything in their taste appear, a phone call to the Cohens was absolutely de rigueur! The collection is notable for its supreme quality, proof of the Cohens' dedication to seeking only those objects that are artistically as well as technically brilliant. What is perhaps even more remarkable, however, is that most of the works in the collection possess a certain light-heartedness, a slight touch of whimsy, which faithfully reflect the spontaneous good humour and cheerfulness of their owners, whose lives are full of fun. The Collector/Dealer Relationship and the Generations! As a young man in the autumn of 1954 I joined the firm of S. Marchant and Son. I was the second generation of a company founded by my father Samuel Sydney Marchant in 1925. This was a remarkable time to begin one's career in the antique business mainly because of the learning opportunities. Goods were plentiful with auctions held in London almost every day. There were many small auctioneers who held specialist sales of Oriental art, but these are now closed or have been taken over by larger firms. Two names that come readily to mind, both subsequently taken over by Phillips, are Puttick and Simpson and Glendinning. It was the latter that was my favourite. Perhaps it was the character of the man, Mr French, who ran the company. He doubled as cataloguer and auctioneer, and general adviser to both buyer and seller. The only thing he did not do was make the tea which was served during an interval half way through the sale. Alas for progress, we lose some of the quality of life in our search for the new, but I digress. Mr French's netsuke auctions were memorable. Can you imagine a handful of dealers and collectors seated about a horseshoe-shaped table covered with green baize? One porter holding a tray with netsuke would walk around the table and in turn show the tray to all the prospective buyers. It gave them the opportunity for a second look and to remind them of the lot on which they were bidding. Occasionally my father would send me to the sale with the instruction to buy anything I liked at two pounds a lot or if it had special charm, I could bid as high as four pounds! If Christies held a sale of Japanese art, one lot would comprise of six or seven netsuke, tied together on a string. This type of lot would often comprise of horses, rats or other zodiac animals, put together so that a more substantial sum, perhaps up to three hundred pounds, could be obtained. Today these pieces would individually be sold for thousands of pounds. It was at one of these auctions that I could meet a client of ours, Mr George Cohen, an avid collector with impeccable taste and as a bonus a charming gentleman. He mentions a purchase from our gallery of an Okatomo netsuke, of a rabbit and young, in his book 'In Search of Netsuke and Inro' on page 14 Netsuke number 44. With the passing of time he introduced me to a new collector, his son John, a man brought up with art, who shared the same high standards as his father. Eventually he took over the collecting mantel of his father just as I succeeded my father as a dealer, so that the tradition of each family passed to the second generation. With this sense of responsibility in mind, in 1981 I recommended John should consider forming a pendant collection. This was a field with good opportunities, few if any specialist collectors and material was available. One had to admit little had been written about the medium and therefore knowledge would be limited. As far as I know, the only previous catalogued exhibitions had been held by Liberty's of London in 1919 and 1925 entitled 'Jade Amulets'. However it offered an exciting prospect and John must have felt equally enthusiastic because he purchased three pieces to begin the collection (numbers P2, P18 and P26). He also continued the search elsewhere and found a fine group of ten from Robert Hall (numbers P24, P33, P54, P59, P63, P65, P66, P67, P69 and P70). Pendants should each have a silk attachment so that they can be suspended when worn. This is achieved by the Chinese using silk cord tied with elaborate knots, often enhanced with seed pearls, and a semi precious bead such as coral or agate. This presents a problem, because many pendants do not have these elaborate silk attachments. Whether the silk has deteriorated and fallen off, or never had them to begin with, is an unanswerable question. I can suggest the earlier jade 18th Century, more tactile pieces never had them. My reasoning being that men in China, even to this day attach them to their belt, and use them as fondling pieces. They wear them also for good luck and long life, as jade is reputed to benefit the wearer in those respects. I believe this is the group that should be referred to as amulets. Surely pendants not tactile, very thin and delicate and usually of fine contrasting colours, are the ones meant to have a silk attachment and in later times they have been worn by women around their neck as jewellery. Many Chinese people believe that green jadeite worn next to the skin will improve in colour, but then mythology has always been a favourite subject in China. In any case this presented a problem for John, as he needed to unify the collection. This would best be served by all the pieces having beautiful attachments. He set about learning the art and as you can see has been very successful. The seventy pendants have another great feature of unity, they all are of outstanding quality and beauty. It is very satisfying for so many years to have had such a close and lasting relationship with the Cohen family. I hope my son Stuart, the third generation of S Marchant and Son can continue the tradition, to recommend pieces to Jason, the third generation of the Cohen family. Research has revealed that very little has been written about Chinese pendants (1) as literature is scarce and usually refers to archaic jade pieces. As such The Cohen Collection is unique in its examples of Qing dynasty pendants in materials such as jades, agates and other more unusual stones. The earliest known exhibitions occurred in 1919 and 1925 when Liberty's of London held two expositions entitled simply 'Jade Amulets.' In these exhibitions they referred to the pieces as ‘amulets’ although it is apparent from the accompanying catalogues that they are ornamental pendants. The catalogues state that ‘amulets’ (pendants) were worn hanging from one shoulder; however this is not always so, although it is easy to see where this idea has its foundations. Liberty's also mention the official string of beads that a Chinese mandarin wore as consisting of 108 beads, a central plaque, and a pendant. These are worn with the plaque and the pendant hanging down the back on the outside of the ceremonial robe. One therefore presumes that these pendants are different to the ‘amulets’ (pendants) described in the catalogues. Museum sources suggest that men and women wore pendants in different ways. It should be pointed out that this refers exclusively to persons of a higher rank as the commoner would not be able to afford the luxury of a precious ornament. Ladies of the imperial court attached pendants to the top button that fastened their robe, on the right hand side near to the collarbone, whilst men would hang them from their belts. It is also a possibility that some tactile pendants or carvings may have been carried in small silk purses hanging from the girdle, and used as fondling pieces. One problem with research in this area is that pendants were not worn as part of official court attire and therefore we cannot refer to the documented regulations (2) for clues to their usage, and other literary references tend to be uninformative. Schuyler Cammann (3) when making an important distinction between toggles and pendants notes that simple charm pendants were called ‘beiqing’, translated as ‘pendant scriptures’ and that ornamental girdle pendants were called ‘beiyu’ (or 'yubei') meaning ‘hanging jades’. The latter had no particular function unless as an indicator of auxiliary marks of rank, as their use was restricted to higher Court officials. One group of pendants which does appear to have a practical function is that of ‘abstinence’ plaques such as those shown in the exhibition at Spink & Son Ltd., London, entitled ‘Minor Arts Of China III' (4) where it is evident from the translation of the characters on the wood plaque: ‘to be in a state of abstinence from food and drink’ that this type of pendant would be worn on the robes of Court ladies during periods of fasting, when sacrifices were offered to Imperial ancestors or deities.' Pendants were attached to the button on the robe by a silken cord which threads through a bead or disc and then through the pendant via what the Chinese call a ‘string-eye’ (so-tzu yen) i.e. a hole or gap, an integral projecting loop, or an attached ring. It is unusual to find both Chinese & Japanese antiques in a single publication. However, having looked at this CD-ROM and talked to the owners one can clearly see the many ways their appreciation of fine craftsmanship together with a love of tactile objects, provides a valid link between these beautiful works of art. The enjoyment of handling wonderful netsuke is very similar to the pleasures we all know of handling a fine jade pendant or snuff bottle. The Cohen's desire to complete sets such as a netsuke with its ojime and inro, rather than just the netsuke, or just the inro, exposed them to the subtleties of Japanese lacquer and led them into collecting works of art in this media. With the Chinese works of art the same rule was applied; the snuff bottles had to be complete with spoons and stoppers, and unusually even the snuff! When collecting pendants, they added the cords and beads as so often these were missing. The majority of the pendants in this collection arrived without any cord and, aiming as always for perfection, the owner learnt to string the pendants himself. The correct method of knotting and threading the silk cord, brought over from Hong Kong, was discovered from a pendant with an original cord which was carefully unknotted noting at each stage how to reconstruct the complicated cord. Most of the beads are of semi-precious stones and are acquired in all sorts of unlikely places. The miniature seed pearls caused a problem as the holes for threading are so tiny that even specialised beading needles are often too large and consequently some of them have to be threaded using very fine fuse wire, a tortuous lengthy process! The Cohen's early collecting days began a world away from Oriental art, with Satinwood furniture, of the Edwardian period, which they admired visually for the liveliness of the wood and the movement apparent in the fine grains. There is a limit to the amount of furniture one can collect and soon the owners had moved away from larger pieces into the engaging world of Japanese art. They began collecting and forming a collection of netsuke (with the help and guidance of George Cohen) of a complete set of animals of the zodiac in both ivory and wood; a task which in its turn soon led them to acquire a small collection of inro which complemented the lacquer boxes and combs already in their possession. A remarkable and early example (L1) by the artist Shibata Zeshin, (1807- 1891) illustrates very well the standards set for themselves in their ideas of collecting i.e. that the inro should be complete with its ojime and netsuke (or manju). The inro, signed by Zeshin, shows a trio of rats stealing eggs; one dark rat is lying on its back carefully holding the brown-pink egg, another rat drags him along, by his tail, whilst the third peers into the bowl of eggs. The move from Japanese lacquer occurred after one particularly frustrating visit to Sotheby's in London where the owner left the sale disappointed by his failure to buy any pieces. Miserably he made his way down the street, and wandered into the Bond Street Arcade, where he chanced upon Estelle Chapman's stand and a large number of Chinese snuff bottles. Not knowing much about them, he allowed the sales assistant to show him their collection, most of which did not really appeal to him. However, when he was shown a group of ‘silhouette agate’ bottles he felt his pulse quicken and a sense of agitation crept upon him that all collectors will recognise. Needless to say, he left with three chalcedony bottles in his pocket captivated by the beauty within the stones and secretly wondering what his wife would say to this diversion from Japanese lacquer. One of these snuff bottles (B25) was a honey coloured agate, the darker skin on the front skillfully depicting a corpulent figure, Pu Tai He Shang, the patron saint of tobacco baring his immense belly to the world - an apt subject with which to start a collection of Chinese snuff bottles! Fortunately his wife was also fascinated by these miniature works of art, as she had previously been a manageress of a jewellery shop in Zurich, Switzerland and had been particularly interested in gemstones. Having attended a two year course in this area as part of her jewellery apprenticeship, she could fully appreciate the complexity of manufacture, and the vision of the craftsmanship in achieving these images on snuff bottles. At the beginning the Cohen's tended to acquire only silhouette and carved agate snuff bottles, keeping track as always of provenance. One of their favourites (B48) is a very well hollowed bulbous honey coloured agate carved on the front with a lively Manchu bannerman astride his galloping charger (1750-1860). It is always a hard task choosing favourites and this is not made any easier by the quality of the snuff bottles in this collection. One arresting example (B56) is a superbly hollowed three colour carved chalcedony snuff bottle, of flattened ovoid form, with on one side a yellow duck resting on a large white leaf against a dark brown background, the reverse carved with a yellow phoenix on a white flowering prunus. (1750-1860). This bottle was exhibited in 1974 by Hugh Moss Ltd. in his Chinese Snuff Bottle Exhibition in London. Yet another snuff bottle stands out (B47), a superbly hollowed honey coloured agate carved in relief with a tethered horse, the reverse plain. (1750 - 1860). Although a common subject, the quality of the carving is quite masterful. There are two factors that make this bottle so special - one is the fluidity of the carving and the other is the clever use of the brilliant translucent reddish colour for the horse. Throughout their collecting days the Cohen's set themselves very high standards, judging pieces not only on an aesthetic level but with the additional criteria of quality, material and subject matter. In addition to this, with the exception of the inside-painted snuff bottles, each bottle contains a different type of snuff, in all approximately eighty blends, together with an attractive stopper and an old spoon. Each piece is therefore highly individual and avoids repetition of popular subjects which often recur throughout the Oriental art field. 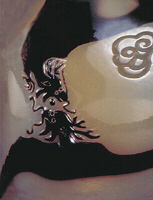 This is well illustrated in the glass group of snuff bottles, an area where, for example, it can be all too easy to acquire a large number of glass overlay bottles carved with similar motifs. Two bottles stand out in this group, both superbly carved and each with its own type of dragon, and although dragons do appear elsewhere in the collection, there appears to be an almost conscious attempt to avoid this common subject. The first bottle (B71), from the Ko collection, is a bulbous milk white glass snuff bottle carved on both sides using a red overlay with a sinuous coiled chilong, the shoulders with mythological animal mask ring handles. (1750-1850). The second snuff bottle (B68) is of ruby red glass and is of a bulbous elongated form carved with an archaic dragon with petal lappets at the neck, the shoulders carved with mock mask and ring handles (1700-1850). This bottle, acquired from Hugh Moss Ltd. and illustrated on the back cover of the International Chinese Snuff Bottle Society's Journal (December 1975) is superbly executed, with the glass towards the centre of the body being very thin, giving it a crisp delicate appearance. As well as considering subject matter, the Cohen’s have a preference for materials in stone and glass, and a particular leaning towards stone snuff bottles where the material is left to speak for itself. One of their favourites (B2) does just that - a miniature rounded agate snuff bottle (height 1"), with the upper half consisting of a translucent beige crystalline formation over a lower half of banded white, beige and dark brown lines. (1750-1860). One of the highlights of my first visit to see this collection was another uncarved agate snuff bottle (B5) which I found totally irresistible. It is of flattened ovoid form and well hollowed with the natural stone forming inclusions of pearl grey, white, blue and green markings. l75O-186O (Ex. Ko Collection). The Cohen’s referred to it as the ‘waterweed’ agate, however I found it reminiscent of the Chinese subject of ‘pine trees in the snow’. One of the important factors in choosing a bottle in a stone such as jade or agate is whether or not the bottle has been well hollowed. The collection has two favoured jade snuff bottles both of which can only be described as ‘eggshell thin’. The first is a superbly hollowed bulbous uncarved snuff bottle (B10), the flawless blue-grey stone left in all its glory; the second (B9) is again superbly hollowed, a ‘celadon’ jade, of plain, tall, rectangular shape, the stone of a powerful green colour. (1750-1850). The collection of pendants began in a similar way to the Cohen’s collection of snuff bottles. A parallel situation was occurring where the market in snuff bottles was fast developing under the auspicious eyes of both Hugh Moss and the I.C.S.B.S. With an increase in awareness came an increase in demand and consequently, in the value of snuff bottles. On one occasion they were visiting Richard Marchant, a dealer in Oriental art in Kensington Church Street, London and could not find a snuff bottle that they liked within their price range. Richard Marchant suggested as an alternative that they might like to look at a small collection of jade carvings he had recently acquired, as he thought they would appeal to them. Amongst this group were several jade pendants which immediately attracted their attention and on this visit they went home with three of them, one of which was a white and russet piece carved as a squirrel with grapes (P29). In a sense it was an almost natural progression. Their interest in jewellery, their joint preference for examples in jade, with the additional attribute of very good quality carving came together in these fascinating pieces. A factor which quickened their interest was the challenge inherent in collecting pieces which were less popular than snuff bottles, as there was no known market, and good quality old pendants were considerably harder to find. It is not clear whether this is due to a lack of awareness in the market, or that pendants are rarer than snuff bottles, although they both feel that the latter is true. None of the dealers that have found pendants for this collection are aware of another collection, and all of them have confirmed, that good quality pendants are indeed much harder to find than comparable snuff bottles. Their second chance to add to this new collection came after they mentioned their growing interest in this area to Robert Hall. He already had a small personal collection of jade pendants which he showed them and which were eventually purchased as a whole group. This collection now totals over seventy pieces, mostly in jade or agate but also including such materials as coral, amber, amethyst, tourmaline and glass. In October 1987, an exhibition of the collection was mounted at Robert Hall's gallery in London to coincide with the annual International Chinese Snuff Bottle Society convention being held there. Research does not reveal any other exhibitions of Qing dynasty pendants between the two exhibitions at Liberty's, London and this exhibition which will be familiar to those who attended the convention. There was no catalogue of the last exhibition however a striking poster illustrating a substantial number of the pendants in the collection was produced. Lindsey Hall started to collect pendants soon after that exhibition, however after a number of years she had only acquired ten pieces and was frustrated with such slow progress. Most of those pendants were recently sold and are now in this collection. There are a number of interesting pieces which cross over all the collections. One object forms a connection between netsuke, lacquer, snuff bottles and pendants. It is a fine double gourd-shaped guri lacquer netsuke (N57) in the form of a snuff bottle complete with spoon and a central link to allow it to hang as a pendant. The bond between snuff bottles and pendants occurs with a well hollowed russet jade snuff bottle (B60) of pebble form, carved in relief, as a marrow with a beetle crawling amongst foliage. One of the branches enables it also to be hung as a pendant. One of the attractions of netsuke, snuff bottles and pendants is that they all function as wonderfully tactile handling pieces, and one feels that the Chinese carvers whether using wood, ivory, jade or hardstones generally took special care to avoid sharp edges that would feel uncomfortable in the hand. One of the Cohen’s favourite pendants illustrates this very well; it is a chalcedony pendant (P53), the reverse carved with raised calligraphy against rockwork, translated as ‘the most fabulous kylin’, the front with a high relief carving of a kylin blowing clouds into the sky, the brown stone contrasting effectively with the milky white background. This pendant from the Suzhou School must rank as one of the finest in this collection, it is breathtaking to look at and marvellous to handle. Occasionally, there are pendants which are technically admirable but which are uncomfortable in the hand and this may have occurred where concessions to the sense of touch were less necessary i.e. if the pendant was worn too high or too low (girdle pendants) for ease in handling. 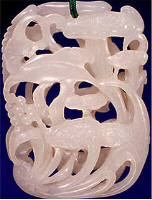 A jade pendant in the collection is a good example of this (P41). Again, manufactured by the Suzhou carvers, it depicts a monkey holding a peach beneath a pine tree, the russet yellow tone against a creamy grey background of dramatic rockwork, a waterfall to one side. It is a fantastic piece visually but as a handling piece leaves much to be desired. The third Suzhou school pendant in the collection (P44) also deserves a mention as it is a prime example of exhibiting the maker’s sense of humour in the work of art - a classic Chinese characteristic. Again in jade, it is carved with a prancing horse against an off-white background with rockwork to one side, under a pine tree with a cheeky monkey hanging off the tree; the reverse with a grey monkey on a lotus pod by rockwork. It is only after handling this tactile and intricate piece that you come across the small monkey hidden upside down beneath the tree. Another favourite pendant is a carnelian example (P65) carved using the red and white inclusions with silkworms and moths amongst mulberry fruit and leaves. It is very nicely undercut in relief and is smooth to the touch. The accompanying bead is also in the form of fruit, carved in green glass as a pair of peaches. Although most pieces in the collection are either jade or agate, the Cohen’s have not restricted themselves exclusively to these materials; rather they have been constrained by the availability of good quality pendants in other materials. One of the most dramatic of these is in amber (P71), well carved as a shi-shi with the young pups carved using the opaque yellow (root amber) whilst the shi-shi itself is of a transparent rich golden honey tone. The owners remain fascinated by their collection; whilst no collection is truly complete, their activities are focused on actively acquiring pendants rather than snuff bottles. Their task is hard yet their enthusiasm is undaunted. Having attempted to share their collection with other collectors they hope that this may bring more pendants to light and that collectors will appreciate the beauty and craftsmanship of the pieces, in some senses so similar to our beloved snuff bottles. 1. In this article there is a distinction made between Chinese pendants and belt toggles used for fastening things to the belt. 2. Medley. M. The Illustrated Regulations for Ceremonial Paraphernalia of the Ch'ing dynasty. Published by Han Shan Tang, 1982. 3. Cammann. S. Chinese Belt Toggles. Oriental Art. 1962. No 2. PP 72-78. 4. Spink & Son Ltd. Catalogue of ‘The Minor Arts of China III’. April 1987 No. 30. pp. 35; No. 46. pp. 43. Cohen. G. In Search of Netsuke and Inro. Published by The Jacey Group of Companies. 1974. Watt. J.C.Y. Chinese Jades From Han to Ch'ing. Published by Asia Society Inc. in association with John Wetherhill. 1980. Kaynes. M. Snuff Bottle Review. 1976. Liberty's of London. Jade Amulets I and II. Catalogues of the exhibitions of 1919 and 1925. Having been invited to comment on the hardstones in this excellent collection I have picked the following, mostly jade items, as being of particular interest. A large pale celadon jade stone (H1). Carved as a double gourd box, surrounded by foliage, and young gourds. This jade box and cover is, very rare, well hollowed and unusually well carved in high relief. Celadon and russet jadeite carving of Guanyin with phoenix and flowers (H5) is an unusual composition. Guanyin is usually depicted on her own, rare with the phoenix. A fine handling piece of white jade (H6) with some russet markings. When viewed by turning this piece around, and upside down, a number of images can be discovered:- lingzhi, pair of quail on rocks, an old prunus tree, a dragon on a rock, and a mandarin duck. Good quality and use of this stone combined with the russet markings. Very pure white nephrite carving of an elephant (H7) resting with its body curled around a small boy reaching up to tickle the elephant's ear with a spray of lingzhi fungus. This is a fine small handling piece, about the size of the average netsuke. The white jade archers ring (H8) carved in relief with a horse, in a continuous mountaineous landscape, that includes under the moon, a temple, a pine tree, and a raised four section seal. Pure colour, well carved and good choice of subject, altogether a fine quality jade of its type. A good spinach jade bowl (H9), well-hollowed and a pleasing form, nicely proportioned and with strong loose ring handles, finely worked floral, chrysanthemum style, foot. A mutton fat Jade belt plaque (H10) undercut and well carved as storks and foliage. This is a fine Ming plaque. The Jade circular spinach screen (H25), appears to be strongly carved with figures in a landscape and of a very good type. Entwined dragon pendant (P9), good tone, particularly well rendered and modelled for a complicated design. The pearl with dragons pendant (P15) is a fine example of 18th century craftsmanship. The phoenix with dragon pendant (P18), is good quality and rare. A pair of dragons pendant (P19), is another good example of an 18th century work. Also the phoenix with lingzhi pendant (P21), is a very fine example. The Camel faced pendant (P30) appears to be a good 17/18th century example. The amethyst and gourd pendant (P65) is well carved with a very fine colour. The bamboo tourmaline pendant (P66), is a rare subject, and very well-carved and pierced. Lastly the Canton enamel wine ewer (M9), is a good example of its type, the floral panels are particularly pleasing. This web is a very enterprising use of the new technology and gives a good overall view of the collection. As you know most of your collection of Japanese Lacquer is of the later period and I tend to specialise in earlier work, but there is a wide range of techniques displayed on your pieces and the quality seems to be uniformly high. It is difficult for me to comment on pieces which I have not seen, and the only ones I have seen are those you bought from me. It is interesting to see, however, that where combs are concerned, you have confined yourself entirely to the earlier pieces, of excellent quality and in fine condition. The result is a small but impressive collection of combs, (L52 to L58) the quality of which approaches that of inro. I have only once seen another collection of this number, period, quality and condition - a private collection in this country. There are earlier combs but, at least outside Japan, they are very seldom seen. 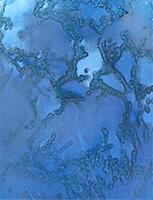 Most of the later and more common examples, of thin cheap lacquer on wood, lacquered tortoiseshell, lacquered ivory and other similar materials and techniques, are later than yours and usually of much inferior quality. They are usually of the Meiji period, whereas I think yours date mainly from the late 18th century to the mid.19th century. 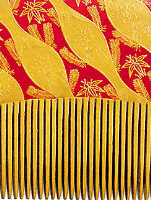 It seems probable that most of the combs brought from Japan by tourists were not bought as works of art but as 'curiosities' and therefore never graced the important art collections. I know (and congratulate you on the fact) that you have bought only the best Japanese combs, and discarded inferior examples in forming your collection. It has always seemed to me that a small collection of only the finest pieces makes a far better art collection than one double the size but with mediocre pieces mixed in with the best. I also believe that it is a better accolade to the fine arts of the nation it represents.